It was agreed that safety in Fitzroy street is to be immediately addressed. JAAG submitted that the entire length of Fitzroy Street and St Kilda Junction pedestrian underpass be considered in the advocacy request to State government with an independent traffic study to be included. Council is also advocating for the development and activation of Junction Oval. JAAG has been keeping abreast of the developments with the impending Junction Oval project which seems to be getting larger and larger! 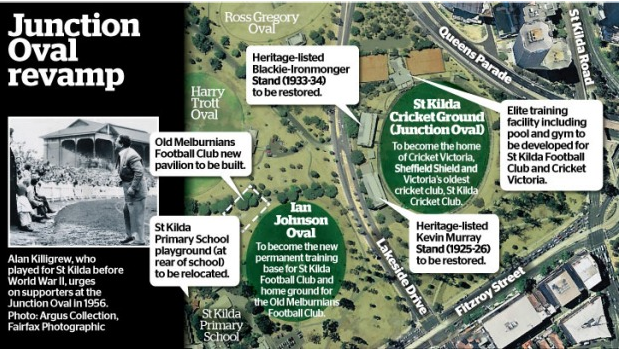 As you may be aware from the media in recent months the St Kilda football club is seeking to work with Cricket Victoria to upgrade sporting facilities at the St Kilda Cricket Grounds and the Ian Johnston oval. The proposed project will ultimately involve Federal, State and local government, Cricket Victoria, Cricket Australia, the AFL, St Kilda Football Club, St Kilda Cricket Club, the Old Melburnian’s amateur football club, the MCG, the MCC, Parks Victoria and St Kilda Park Primary School. JAAG believes this project, should it come to fruition, may also encourage the State government to budget for St Kilda junction to be upgraded to ensure safe passage for public transport users. JAAG will continue to actively engage with stakeholders in both projects. Read more about the Junction Oval.